Spam - now as popular as ever. Ho hum. 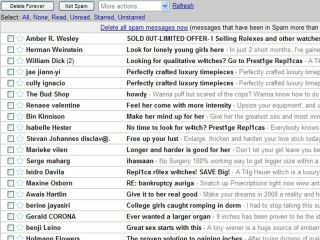 The days of blissfully empty in-boxes are long gone - get ready for another onslaught of spam. Symantec's monthly State of Spam report, out today, shows that levels of spam are approaching the dizzy heights they reached last year, before the sudden shutdown of rogue hosting company McColo. The EMEA region continues to be the leading source of all zombie IP addresses, hosting 45 per cent of active zombie computers in March 2009 - although Brazil has seen a surge in compromised computers. It now has 14 per cent of all the world's zombie machines. Despite these figures, the US continues to be the main source of spam messages (accounting for a full quarter of all spam sent) - the UK has the dubious honour of rounding out the top ten, with a 2 per cent share. One ray of spring sunshine - video spam has not taken off as some experts feared. The most common size of spam email (75 per cent of all sent) is a featherweight 2 to 5 KB.